KAUST-Swiss Residency Exchange September 2017: The artists Zahrah Algamdi and Muhannad Shono from Saudi Arabia at the Aquatic Science and Technology Eawag in Dübendorf, Switzerland. Residency period: September until December 2017.
artists-in-labs Master Series pilot project 2017: Artist and student of MA Transdisciplinarity at ZHdK, Chi-yung Wong, at the Translational Neuromodeling Unit at University of Zurich. In collaboration with MA Transdisciplinarity / ZHdK. artists-in-labs residency of South African artist Miranda Moss in spring 2017: Miranda Moss from Cape Town at the Swiss Federal Institute for Forest, Snow and Landscape Research WSL. 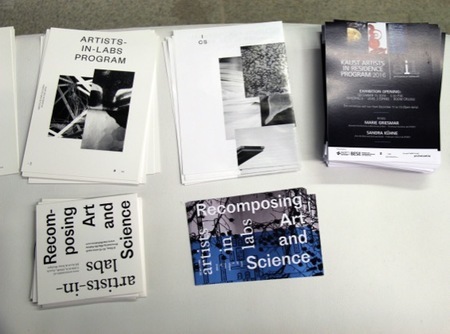 Since 2003, the artists-in-labs program has been facilitating artistic research by way of long-term residencies for artists in scientific laboratories and research institutes. This programme is part of the Institute for Cultural Studies in the Arts (ICS) at the Zurich University of the Arts (ZHdK) and promotes sustainable collaboration between artists and scientists of all disciplines, not just in Switzerland but all around the world. 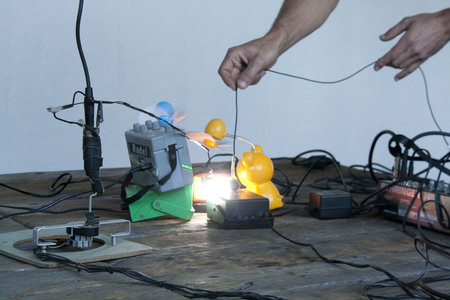 These long-term interdisciplinary and cross-border collaborations provide artists with an opportunity to critically engage with the sciences and their experimental and aesthetic dimensions. This includes explorations of the site of the laboratory, as well as a range of scientific topics, methods and technologies. Our interests lie in the interaction and expansion of types of contemporary knowledge and artistic production, and the creative potential resulting from exploring the parallels and differences of scientific and artistic practices. We perceive our work as being culturally engaged and of a curatorial and mediatory nature. Publications along with accompanying scientific research record the processes and results of these cross-border collaborations and offer reflections on them. In addition, in recent years the programme has expanded to include a student-engaged dimension, seeing undergraduate arts and science students coming together to brainstorm some of the key issues of our times. The results include a range of science and arts projects, with outputs feeding into both scientific research and artistic practice. All the collaborations the programme produces are presented at various national and international exhibitions, symposia and workshops, making it possible to share findings and ideas, and to provide accessible discussions and aesthetic experiences to our students, peers and to the public. The artists-in-labs program ist part of the Institute for Cultural Studies in the Arts (ICS) of the Zürcher Hochschule der Künste (ZHdK). Please also visit our Pages on Facebook and Vimeo for infos on current activities and films on our artists-in-labs residencies.